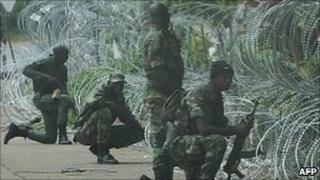 Image caption Mr Ouattara's HQ are protected by UN peacekeepers and fighters from a former rebel group. Ivory Coast troops have surrounded a hotel in the main city Abidjan housing Alassane Ouattara, the UN-backed winner of disputed presidential elections. The troops loyal to incumbent President Laurent Gbagbo are facing UN forces and former rebel soldiers who are protecting Mr Ouattara's headquarters. Both Mr Ouattara and Mr Gbagbo had declared themselves the winner of last month's election. The EU has agreed sanctions against Mr Gbagbo and his supporters. The BBC's John James in Abidjan says rumours abound in the capital that troops loyal to Mr Gbagbo plan to storm the waterfront Hotel Golf where Mr Ouattara and his team work, or that Mr Ouattara's supporters might try to take control of state television. The troops supporting Mr Gbagbo reportedly include members of the presidential guard and gendarmes in trucks mounted with machine-guns. The hotel is guarded by UN peacekeepers and fighters from the New Forces (FN), a former rebel group that still controls the north of the country and supports Mr Ouattara, who is widely recognised as the winner of the election on 28 November. Ivory Coast's electoral commission declared that Mr Ouattara won the run-off by 54.1% to 45.9%, but Mr Gbagbo immediately refused to concede power. Last week he said he was open to negotiation, but he refused offers to go into exile and seems to want some kind of power-sharing deal, an option the opposition rejects outright. The African Union has suspended Ivory Coast while Mr Gbagbo stays in office. Both Mr Gbagbo and Mr Ouattara have taken oaths of office and appointed governments. Mr Gbagbo has the support of several leading generals. One of his key allies also controls the country's constitutional council, which overturned the election results, saying large numbers of votes cast in the north, Mr Ouattara's home regions, were fraudulent. EU foreign ministers said they had agreed sanctions against Ivorian officials refusing to recognise Mr Ouattara as the country's new leader. Sanctions would target "those who are obstructing the process of peace and national reconciliation, and in particular who are jeopardising the proper outcome of the electoral process", the ministers said in a statement on Monday. The measures include a visa ban and the freezing of assets of the members of Mr Gbagbo's regime.